A pioneering Sri Lankan education institute with 16 years in the field, the International Institute of Health Science (IIHS) recently opened up the Advanced Diploma in Physiotherapy program for 2019. Applications for this program are being accepted until 10 December 2018. Importantly, the Advanced Diploma in Physiotherapy program at IIHS is a three-year program that provides students with international academic and career pathways to Australia, UK, Europe and USA. To speed up this process even further, IIHS currently offers pathways to Deakin University for Nursing and Bio Medical Science students. Students who have completed the Advanced Diploma at IIHS can easily follow through with a Bachelor’s Degree in a related program at Deakin University. By accessing the Deakin University pathway, IIHS students enjoy unprecedented access to world class facilities at the University’s Melbourne, Burwood, Geelong campuses, with extra service and support also provided by Deakin University’s dedicated international support staff. Student accommodation are also readily available at these campuses. Following which, IIHS graduates of the three-year Advanced Diploma in Physiotherapy can fast-track their career with one of the following Bachelor’s degree programs at Deakin University: Bachelor of Exercise and Sports Science, Bachelors of Exercise and Sport Science, Bachelor of Business (Sport Management), Bachelor of Exercise and Sport Science and Bachelor of Nutrition Science. Deakin University’s school of Exercise and Nutrition Sciences is ranked No. 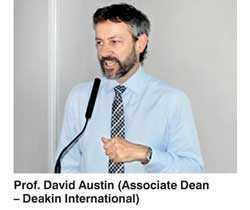 3 in the world and is a reflection of its first-class teaching and research facilities, while Deakin University is rated No. 1 in the Australian State of Victoria for student satisfaction and has been for the past eight years. “This program is designed for sports persons who wish to excel in the industry through sports related academia. With ample job opportunities globally, this program will open doors as a highly recognised profession. The global sports and nutrition market is above $ 40 billion and currently the industry growth is at 10%. Furthermore, students who follow this program will be equipped with a physiotherapy background which is an added advantage,” stated IIHS CEO / Director of Academics Dr. Kithsiri Edirisinghe. Valuing a SMART learning environment, with a continuously upgraded curriculum through the input of its partners and aligned with international trends in education and teaching, IIHS produced the first Collaborative Teaching in environment in South Asia – a system which supports learning outcomes whilst students are provided with ownership of their learning experience. IIHS prides itself on being the No. 1 in terms of research, evidence based practice and reflective practice, arming students with a skill set to understand innovative and unique trends in healthcare. Further, students during their time at IIHS engage in multiple community projects so they build empathy and learn about existing local and international healthcare issues at a community level. IIHS has identified multiple areas in the learning process, which would make a student internationally geared. Distinct areas and features include personality development and soft skill development whilst gaining a thorough understanding of traditional methods education versus modern virtual education.